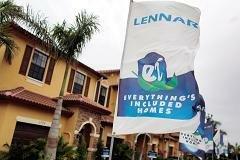 Generational forces and still-tight mortgage lending standards are holding back housing from a more robust recovery, Lennar (LEN) CEO Stuart Miller told CNBC on Wednesday. "Right now we're trending to about a million housing starts per year," Miller said in a " Squawk Box " interview. "Normalized housing is somewhere around 1.5 million." He pointed out that housing starts fell below 500,000 in 2009. Miller, whose company is one of the nation's largest home builders, predicted a "slow steady recovery" over the next three to five years. But he acknowledged: "We still have a ways to go." He sees the challenges as two-fold. "The mortgage market is not enabling demand to form at normalized levels." The other, he said, is insufficient growth in the number of households. "More of the millennial generation are doubling up [and] living at home," he said. "It's unclear as to when household formation will resume-whether this generation is going to resume at the same stage of life as generations in the past have formed households." But Miller believes it'll happen at some point for the millennials-born between the early 1980s and the early 2000s. The housing industry will have to play catch-up, he added. "We've been under-producing what's needed for a growing population, and for what should be normalized household formation."